This article discusses Inspection and Testing methodologies and outlines the multipath approach to Quality and Inspection adopted at Tenkay as part of our “Right First Time” philosophy. At Tenkay we are occasionally asked why we do not have 100% Inspection of our products. 100% final inspection is often seen as the only way to ensure that fault free, quality products reach the customer. Dr Deming discusses the role of inspection in his book “Out of Crisis” in which he sets out 14 key principles for management to follow for significantly improving the effectiveness of a business or organization. This does not mean that Inspection has no role to play in producing a quality product, it means that quality has to be built into the organisation such that products are manufactured “Right First Time”, the role of Inspection shifts from being a safety net to the role of maintaining, and improving, the quality of the process and products. Shigeo Shingo is considered by many to have been the worlds’ leading expert manufacturing practitioner and was a powerful force behind the Toyota Production System. He was the person behind Poka-yoke (Error proof) and Just-In-Time methods. Judgment inspection is an inspection that is performed after the fact to discover defects. The batch is produced, and then inspection is performed to determine if the lot is acceptable or not. The safety net approach. In Shingo’s words “It (Judgment Inspection) remains inherently a kind of post-mortem inspection however, for no matter how accurately and thoroughly it is performed, it can in no way contribute to lowering the defect rate in the plant itself.” Shingo continues to state that the Judgment Inspection method is consequently of no value, if one wants to bring down defect rates within plants. Informative Inspection is an inspection that helps in reducing defects. This method feeds back information to the work process involved, thus allowing actions to take place to correct the process. Shingo describes three types of Informative Inspections. Statistical Quality Control Systems – This is the system where production data such as efficiencies and failure rates are monitored and analysed in order to identify trends or out of control processes, and thus aid in getting the process back to stability. Self-check systems – This is the system where the operator can inspect the work that he/she did, and fix the problem immediately. The final category is Source Inspection. In this category, the feedback loop is so short that as soon as the error occurs, the feedback kicks in preventing the error from becoming a defect. An example of source inspection is First Off Inspection. Here at Tenkay we use a Multipath approach to inspection and test which uses a combination of all three inspection types. PCAs assembled at Tenkay can be either conventional through hole plated which are hand assembled or Surface Mount assemblies which are silk screened, component placed and reflow soldered by our state of the art SMT production line. The inspection regimes are the same for both except for an additional reel and feeder inspection before assembly commences on the SMT line. The Assembly of the batch then proceeds. A sample of the batch is then 100% inspected. The sample size is determined by the Inspection team leader based on the pass rate history but is typically 5%. If a single error is found the entire batch is sent back to the PCB line for self-inspection and rework by the operative. (Informative Inspection). Finally, all PCAs are Functionally tested, this will pick up any component failures that inspection alone cannot find. Any faulty PCAs sent back for rework (Judgement Inspection). Data such as failure rate is recorded and analysed to ensure that the quality of the process is maintained (Informative Inspection). The Assembly of the batch then proceeds. A sample of the batch is then 100% inspected. The sample size is determined by the Inspection team leader based on the pass rate history but is typically 5%. If a single error is found the entire batch is sent back to the operator for rework and retest by the operative. (Informative Inspection). At the beginning of this article I said that we are occasionally asked why we do not have 100% Inspection of our products. 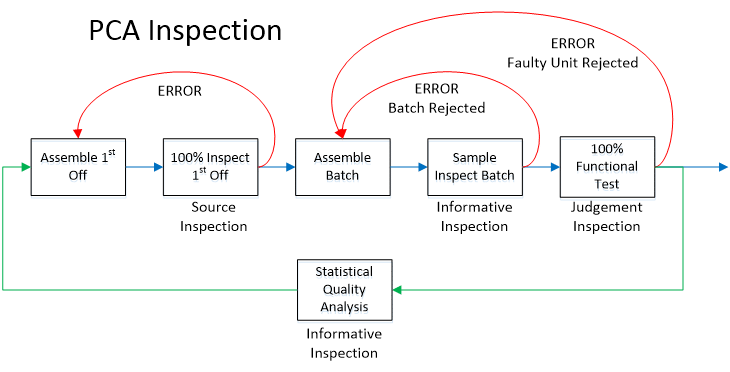 Hopefully this article will have demonstrated why 100% inspection alone is unsatisfactory and the advantages of our multipath approach to inspection and test. Deming, W Edwards. 1982. Out of the Crisis. Out of the crisis. 1982. Jose, Harish. 2015. Is Inspection Value Added? My notes….Quality, Data Science, Strategy & Lean. [Online] August 30th, 2015. [Cited: October 12th, 2016.] https://harishsnotebook.wordpress.com/2015/08/30/is-inspection-value-added/. Juran. 1999. Measure of Inspector and Test Accuracy. [book auth.] Joseph M Juran. Juran’s Quality Handbook. s.l. : McGraw Hill, 1999. If you need to subcontract part of your manufacturing process and need a reliable partner, call us today to see what we can do.